I think that there's something about kids around Ethan's age of four and a half that their dreams really become more and more vivid, which unfortunately means that his nightmares are also much more disturbing. So when I mentioned that we could make a dream catcher to catch all of his bad dreams Ethan was very excited to help make one and to give it a try. Of course I should say that this is a dream catcher craft and is not a traditional dream catcher, though the original is definitely the inspiration for the craft. The idea that the spider web pattern in the middle catches the bad dreams during the night but lets the good dreams slide down the strings and through the feathers to the little dreamer sleeping below. Then the bad dreams that were caught are released during the light of day. The idea is very appealing to us and I hope that it helps Ethan feel more positive before bed time about his dreams. The craft was really simple to put together and great for Ethan's fine motor control with the threading of the buttons and beads. The string that we used was quite thick, so I started by wrapping some tape around the end of it to make it a bit pointy, which made it easier for Ethan to thread the buttons through. I then tied the strings across the ring from one end to the other. We repeated this process of threading buttons and tying the strings on for three strands of buttons. The next step was to tie the feathers to the end of three more strands of string (I did this part as it was a bit tricky) then Ethan threaded some beads onto the strings. I tied a knot in the middle of the string to make a second section for Ethan to put beads on as well. I then tied all of these strings on as well, and our dream catcher was complete. Ethan is very happy to be having this craft hanging up in his room and I think he's also quite proud that we made something together that has a special purpose for him. 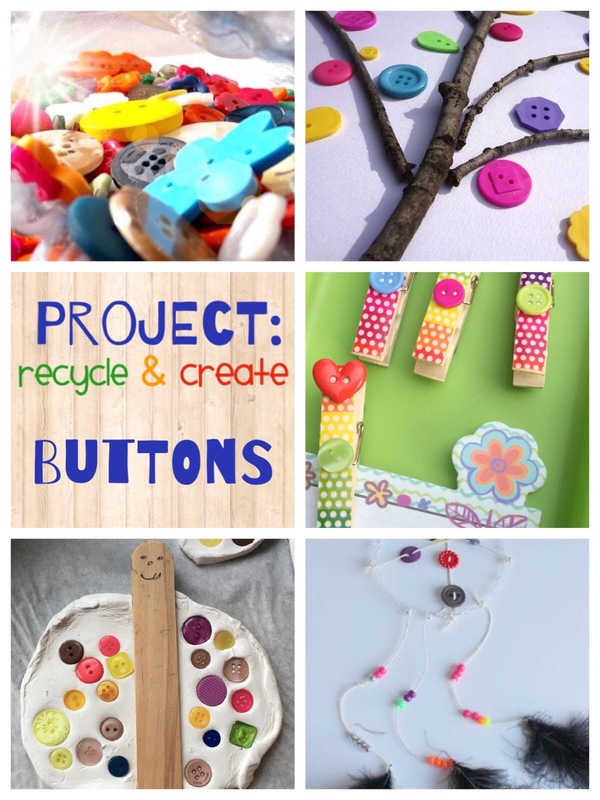 This post is part of the Project: Recycle and Create blog hop and this month's theme is buttons, check out all of these fun crafts that you can make with buttons! Great fine motor idea! I hope it helps a bit with his bad dreams! A very pretty use for buttons! Thanks for participating!